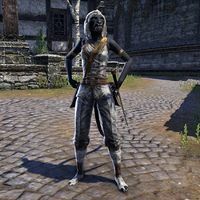 Azeriba is a Khajiit outlaw who can be found sweeping outside the Stogrin House in Daggerfall. Talking to her marks the Ilessan Tower on your map. "Do you think the town walls are strong and solid? I think so. I think we're well and truly safe here." "No, not anymore. There's steady work and it's nice here. Not to mention that the walls are thick and strong. City life can be dangerous, but it's nowhere near as deadly as life in the wilderness." Did something happen out there? "No, but it could have! I used to explore a lot, go on adventures. And then I discovered that old Ilessan Tower. The place gave me a really bad feeling. Now I know that adventuring isn't for me. I'm staying in the city from now on."